Hi friends, today we will talk about a fabulous app launched by Google. Google is really imaging always develop an app out of the world. This is Google Goggle app. You can search any picture which has taken by your device camera. Along with it you can search about any photo by pointing at a painting, QR code or Barcode, a popular image or a product. If this app find it in database, you can get all useful information provided by this app. It is also very useful app to work as a QR / Barcode code scanner. Google Goggles support English, Italian, French, German, Portuguese, Spanish, Turkish, and Russian, and Google Goggles can translate it, into other languages. 1. You can scan barcode using Google Goggles to get product information. 2. 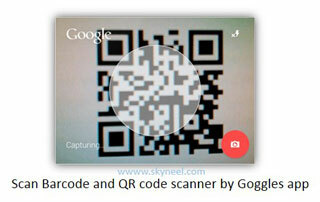 You can aslo scan QR code using Google Goggles to extract any information. 3. This app will help you to recognize popular landmarks. 4. You can do translation task by taking a picture of other language text by this app. 5. You can add Contacts by scanning QR codes or business cards with the help of this app. 6. You can scan text using Optical Character Recognition by Google Goggles app. 7. You can recognize paintings, CD & DVDs, books, and just about any 2D image. 8. It will help in solving Sudoku puzzles. 9. You can find similar products of searching product by this app. If you are shopping online and download so many app then it will make easier for you. You must install this fabulous app (Google Goggle app) on you mobile from Google play store click here.